Ted Hughes. Hughes, Ted, photograph by Mark Gerson. Reproduced by permission. Ted Hughes used a rich, vibrant language to explore themes that were mythic, earthy, and elemental. Throughout his long poetic career, Hughes was interested in confronting the rougher instincts that govern people’s relationships with one another and with nature. When he began writing poetry in the 1950s, Hughes’s verse signaled a dramatic departure from the more polite and understated styles of the period. He is also widely remembered, not always positively, as the husband of the brilliant but troubled poet Sylvia Plath, who committed suicide in 1963. Poetry and Plath. 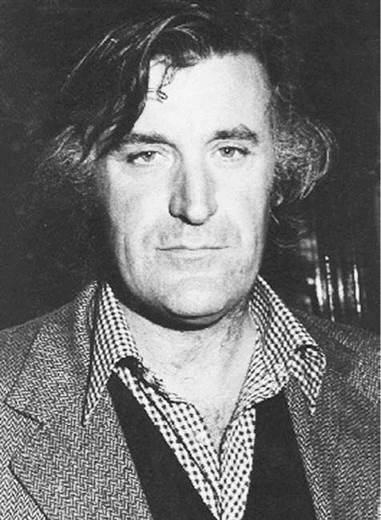 Ted Hughes was born as Edward James Hughes on August 17, 1930, in Mytholmroyd, a small town in Yorkshire, England. His father was a carpenter who had seen service in World War I. Throughout his life (and even in his death, where his ashes were scattered on a remote hillside miles from any road), Hughes remained connected to the atmosphere of the English countryside. He did not write about rolling in the daffodils as his predecessor William Wordsworth did; Hughes employed a darker vision of the literal and symbolic ruggedness of the landscape. After attending school in South Yorkshire, where he began writing poetry, he was awarded a scholarship to Cambridge in 1948 that he took after a brief stint in the Royal Air Force. He studied English literature for two years, then switched to archaeology and anthropology, two subjects that were of immense importance to his work. While at Cambridge, he published little, but spent his time working as, among other things, a rose gardener, a schoolteacher, and a zoo attendant. All three of these jobs are reflected in his poetry in later years. It was at a literary party in Cambridge in 1956 that he met a fellow student, the American poet Sylvia Plath. Within four months they were married. Plath encouraged Hughes to work harder at getting his poems published, and his first book, The Hawk in the Rain, was published to acclaim in both the United States and Britain in 1957. Suicides. After a short period teaching in Massachusetts, Hughes and Plath returned to settle in England. They had two children and moved to a thatched cottage in a small Devonshire village. When Hughes fell in love with another woman, his marriage to Plath collapsed. Plath moved back to London, where, in a depressed state, she committed suicide in February 1963. Hughes was deeply affected by her death and wrote little poetry for the next three years. He instead devoted much time and studious care to the editing of Plath’s poems and journals. After many decades of refusing to speak about her to the public, he surprised everyone shortly before his own death by publishing Birthday Letters (1998), a series of candid and intimate poems about Plath and their stormy relationship. From the early 1960s on, Hughes published a great deal of prose, which contains valuable hints for understanding his later poetry. Hughes’s prose demonstrates his continuing interest in myth, folklore, the occult, and the spirituality of primitive man. These ideas eventually fused with his established interests in animals and nature, which resulted in what is widely considered Hughes’s major work, Crow (1970). Hughes in fact created, in the course of writing these poems, an elaborate folktale about the dark side of nature. Hughes has said in an interview: ‘‘The first idea of Crow was really an idea of style. ...to write his songs, the songs that a Crow would sing. In other words, songs with no music whatsoever, in a super-simple and a super-ugly language which would in a way shed everything except just what he wanted to say.’’ The pessimistic view of life found in Crow can perhaps be explained by personal tragedies that happened in Hughes’s life a year and a half before Crow was published. His companion, Assia Wevill, killed herself in March 1969 in the same manner as Plath and also took the life of the young daughter she had with Hughes. A New Direction. Hughes married his second wife, Carol Orchard, in 1970. Hughes began expanding his work to drama, children’s literature, literary criticism (especially of William Shakespeare), translations of Greek classics, and illustrated books. He settled in the countryside of Devon and became involved in farming, especially sheep and cattle raising, which he writes of in Moortown (1979). These poems, written in a wide variety of styles, describe the everyday experience of life in the countryside. Rather than stressing the unbridgeable gaps between mankind and animals, as in his earlier poems, Hughes writes of livestock here with a farmer’s easy familiarity. The farm presents a continuing cycle of birth and death in which the human beings participate, as in bringing calves and lambs into the world or putting diseased animals out of their misery. The book is dedicated to the memory of Jack Orchard, Hughes’s father-in-law. Hughes remembers him at work about the farm, shearing sheep, building a fence in a December downpour, and doing everything as a man who is instinctively at home with his work and moving in harmony with nature. In 1984 Hughes was appointed poet laureate, the honor of being the ‘‘national poet’’ of Britain, given to just one person at a time until their death. The laureateship is usually given to poets whose writings are uncontroversial in style and theme, but Hughes shattered that stereotype for all future poets of his country. He died at his home in North Tawton, England, on October 28, 1998. The Beatles (1960-1970): John Lennon, Paul McCartney, George Harrison, and Ringo Starr became the most popular and progressive rock band of their time, inspiring an outburst of artistic creativity and confidence throughout Europe and America during the 1960s. Samuel Beckett (1906-1989): Irish playwright and poet who found a dark humor and sense of futility in people's attempts to find meaning and lasting happiness in an uncaring universe. Carl Jung (1875-1961): Swiss analytical psychologist who theorized that "archetypes"—familiar myths, symbols, and images—are part of the "collective unconscious" of mankind. Philip Larkin (1922-1985): A witty, satirical, and nostalgic poet who many assumed would become the English poet laureate when Hughes was appointed to the position in 1984. Robert Lowell (1917-1977), American poet who, like Hughes, wrote technically sophisticated and heavily symbolic verse. ''Lines Written a Few Miles Above Tintern Abbey'' (1798), a poem by William Wordsworth. This classic poem of the Romantic period captures Wordsworth's philosophy on the power of nature. Walden (1854), a collection of essays and recollections by Henry David Thoreau. Thoreau famously spent more than two years, mostly in solitude, in a cabin near Walden Pond in Massachusetts. His book contains many close descriptions of the animals and natural features of Walden. Birds, Beasts, and Flowers (1923), a collection of poetry by D. H. Lawrence. These poems describe the sometimes shocking and amusing nature of animals and plants, showing what we can learn from the unselfconscious way they are in tune with the cycles of birth, life, and death. The Call of the Wild (1903), a novel by Jack London. This short novel is told from the perspective of a domestic pet dog, Buck, who returns to a primitive world to become the leader of a pack of wolves. Hughes’s poetry takes part in the modernist movement, dating from the 1900s up to the 1950s and beyond, which was a reaction to the strict realism and conventional morality of literature in the Victorian 1800s. Modernist art is more abstract, impressionistic, and symbolic than Victorian art. It is also less confident than Victorian art, expressing themes of self-exploration, pessimism about the present and future, and doubt about what a single individual can do to stem the tide of violence and cultural decay—all themes made urgent throughout the period of the two world wars. T. S. Eliot, Ezra Pound, James Joyce, and Virginia Woolf shared with Hughes an exploration of individual consciousness sometimes expressed in fragmented, difficult language. Animals. Hughes’s works, however, perhaps have the most in common with the poetry of D. H. Lawrence. Lawrence is more widely known for his novels, but his poetry often deals with the alien world of animals in a flexible language that seeks to capture something of each animal’s style and nature. Where Lawrence’s work deals with one animal at a time, often focusing on themes of sexuality and violence, Hughes often places his animals in a much wider context of nature as a whole and frames them with mythology and symbolism. Hughes often wrote about mankind most effectively by excluding it entirely: By writing about animals and showing us what mankind is not, he offers insight into what mankind is and has the potential to be. Animals participate in the cycles of natural energy from which man has grown distant. For example, in Crow, the black bird symbolizes the lowest common denominator of life, the stubborn will to live that outlasts even the worst disasters. Landscape. Hughes is also one of the most important contemporary poets of the natural landscape. There is a long tradition of ‘‘pastoral’’ poetry that dates back to the ancient Greeks. These decorative and exaggerated poems (almost always written by courtly city dwellers who spent little time in the actual countryside) celebrated the simple, romantic lives of idealized shepherds and shepherdesses who spent their days pining for one another and gazing at the peaceful hillsides. With the Romantic movement (1790s-1830s), poets such as William Wordsworth and John Keats found a new (although sometimes sentimentalized) realism in nature, making claims of its restorative power for mankind’s gentler nature. Modernist poets generally avoided nature poetry—Hughes is one of the few exceptions—as they tended to focus instead on the psychology of the individual. The untamable wildness that Hughes finds in animals and nature has been a dominant influence on many contemporary poets, such as Michael Longley and Thom Gunn. As interdisciplinary scholars shape the new field of animal studies, Hughes’s distinctive voice is likely to find an even wider audience. Plath’s Influence. The one poet who had the greatest impact on Hughes was the same poet on whom he had the greatest impact—Sylvia Plath. Plath and Hughes encouraged one another to strive for more complex and personal expression and to explore with great honesty themes of longing, memory, and identity. After Plath’s death, Hughes edited and promoted her writing (as well as destroying some of it to protect their children, as he claimed), and his last major work was a collection of poems he wrote about their life together titled Birthday Letters. Ted Hughes enjoyed a rapid rise to fame, thanks in part to a prestigious poetry contest he won at the age of twenty-seven. His first book, The Hawk in the Rain, was picked up by a major publisher in England and the United States in 1957 and received very favorable reviews. Critics were impressed by the surprisingly confident and mature poetic voice of the young poet. There were some misfires in Hughes’s career. One was his collaboration with theater director Peter Brook, Orghast, which was written and performed in Iran. Hughes created an entirely new language with the intention of communicating emotionally, beneath the level of logical comprehension. Another critical failure was his narrative poem Gaudete (1977), a grim and poorly constructed tale of a priest who is replaced with an evil double who seduces his parishioners into a sexual cult. Hughes has also received criticism from Sylvia Plath’s devoted readers, some of whom would boo at Hughes’s readings, blaming him for her depression and suicide. Judged on its own merits, however, Hughes’s poetry for adults has consistently received favorable reviews, and even those critics who find it unnecessarily violent or pessimistic still appreciate its vigor and technical virtuosity. 1. How did Sylvia Plath influence Ted Hughes’s life and work? How did he influence hers? 2. Read Hughes’s Crow: From the Life and Songs of the Crow. Do you find the crow to be symbolic, or do think the poems are more meaningful if the crow is just a crow? 3. Is poetry about nature more or less relevant in our time, with the rise of cities and the spread of suburbs? What new perspectives can nature poetry take, and how has Hughes’s work contributed to that? 4. How do archeology and anthropology influence Hughes’s work? Feinstein, Elaine. Ted Hughes, The Life of a Poet. New York: Norton, 2003. Gifford, Terry and Neil Roberts. Ted Hughes: A Critical Study. London: Faber & Faber, 1981. Hirschberg, Stuart. Myth in the Poetry of Ted Hughes: A Guide to the Poems. Portmarnock, Ireland: Wolfhound Press, 1981. Malcolm, Janet. The Silent Woman: Sylvia Plath & Ted Hughes. New York: Knopf, 1994. Roberts, Neil. Ted Hughes: A Literary Life. New York: Palgrave Macmillan, 2006. Sagar, Keith. The Art of Ted Hughes, enlarged edition. Cambridge & New York: Cambridge University Press, 1978. Scigaj, Leonard M. The Poetry of Ted Hughes: Form and Imagination. Iowa City, Iowa: University of Iowa Press, 1986. Scigaj, Leonard M., ed. Critical Essays on Ted Hughes. New York: G. K. Hall, 1992. Wilson, Jane. Backing Horses: A Comparison between Larkin’s and Hughes’ Poetry. Potree, Scotland: Aquila, 1982. Centre for Ted Hughes Studies. Retrieved February 17, 2008, from http://www3.sympatico.ca/sylviapaul/hughes_index.htm. Kazzer, Claas. Earth-Moon: A Ted Hughes Website. Retrieved February 17, 2008, from http://www.earth-moon.org. Skea, Ann. The Ted Hughes Homepage. Retrieved February 17, 2008, from http://www.zeta.org.au/~annskea/THHome.htmom.